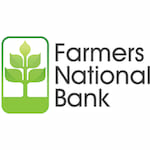 Farmers National Bank was established in 1900. They offer a comprehensive range of products and services, including checking and savings, loans, business services, mortgages, investments, insurance, as well as online and mobile banking technologies. Their mission is to remain a strong, independent community bank committed to optimizing value by engaging customers, empowering employees and delivering a positive impact.